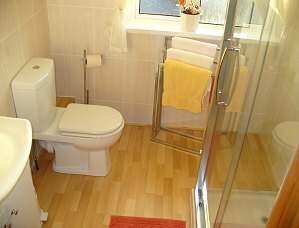 on A2 Antrim Coast road with all rooms en-suite"
Double/twin from £25 per person sharing - single occupancy from £30 Family from £60 per room, all en-suite offering bright comfortable facilities welcome tray with tea/coffee, sky t.v. and dvd library. Magnificent vistas particularly along the Antrim Coast, a coastline that looks like something out of Myst. It lies along the most windy, breathtaking coastal cliffs. 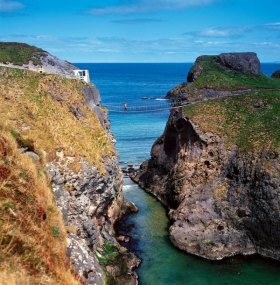 The second most spectacular road trip in the world; the Antrim Coast road winds through idyllic villages, past the foot of the nine glens under bridges and arches to the Giant's Causeway and Dunluce Castle. Arguably the most spectacular 60 miles in Britain. The fifth most beautiful spot in the world in a consumer poll in November, 2006 behind Sydney Opera House, a sunset in Mauritius, Lake Wakatipu in New Zealand and Victoria Falls in Zambia. Built in 1936 Inverbann was originally a doctors house, indeed the original bell system with patients doors and surgery tags are still in service - do not worry the doctors have gone. 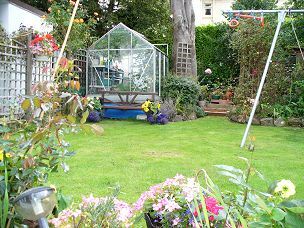 With lock-up garages, central heating, double glazing and gardens at the rear, which are also accessible with plenty of room to relax on a nice day with tea or coffee or even a glass of something cool with our compliments. 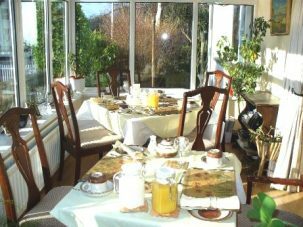 The price for accommodation is £25 per person per night (child rates are negotiable) and includes your choice of either a full Ulster, Vegetarian or Continental Breakfast, served in our dining room in the conservatory. 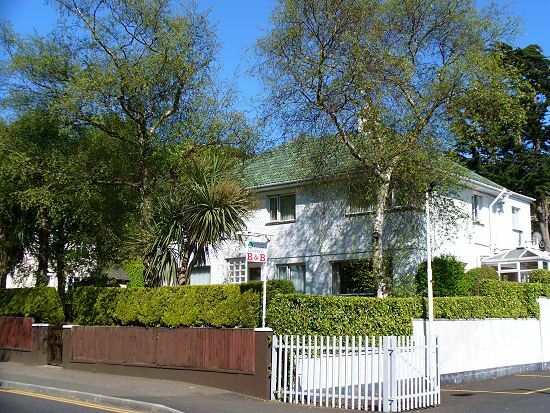 We are the first house on the right leaving Larne on the A2 North (Antrim Coast Road) and are a few minutes drive from Larne Harbour, 30 minutes from Belfast International Airport and Belfast George Best Airport - a short walk from the shops/restaurants/bus/train stations. Jim and Joy look forward to giving you a warm welcome at Inverbann. 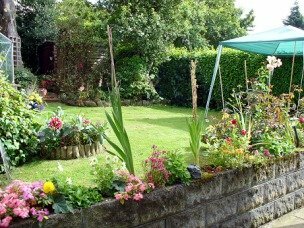 "Thank you and Joy for being so friendly – we had so much fun and laughter at your home – the relaxing glass of wine on arrival that evening was fun for us all. I have not seen Barry relax in that manner since Burns night. Your bottle of wine is home in Canada waiting an appropriate moment to drink a toast to your family. 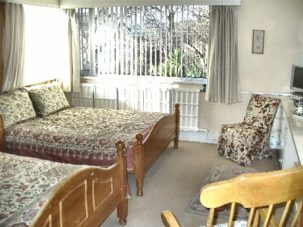 If you are ever near Vancouver, we do not have a B & B, but we do have an extra bedroom open to you anytime. Cheers." "My grand-daughter Meghan and I had a great time staying with you. Thank you. Best house ever." "Thanks for your generous hospitality and help during our stay, the craic was fantastic – here’s to the next time." 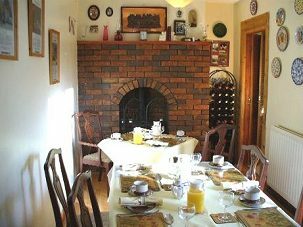 "We really enjoyed our stay with you and Joy on our first visit to Larne, you have a beautiful home and we felt very much at home and enjoyed your company at the Chinese especially your expertise of turning the water into wine." 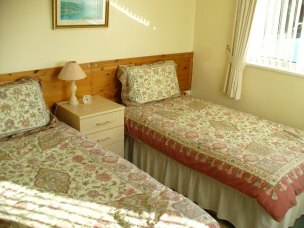 "Your B&B fitted our needs nicely and your Irish porridge was fantastic! Verin also loved the full Ulster breakfast - so did our waistlines, the wheaten bread was my special love. Our stay in Ireland was fantastic,the friendliness of everyone as well as the beautiful scenery which gave me such a feeling of peace - so much variety in such a small place-amazing." "Jim,Joy,& Alfie, Just returned from staying at Inverban,I agree that this B&B is Fantastic, breakfast great and room spotlessly clean Jim thank you so much for all your help from advising us where to eat, picking us up at Port ,getting up at 6.00 am to take us back to Port.You both made or stay enjoyable We will certainly be returning, a real Wee gem In Larne." Click here to access our Tripadvisor review page.